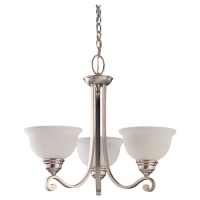 This classic chandelier has a brushed nickel finish. It uses three 13 watt bulbs, offering the amount of light equivalent to that produced by a 120-150 watt incandescent fixture. The diffuser is an excavated Alabaster glass diffuser.